For those born after the Second World War life on the Home Front is often viewed as a rather romantic, or dangerous experience, of air raids, doomed love-affairs, dances, and plucky defiance. Of course all these things happened, but the day-to-day reality of life in wartime Britain was a more mundane struggle, not with the Luftwaffe, but with making ends meet under austerity, rationing, and shortages. How did you prepare your home and family for the air raids. What were the blackout regulations and how did people cope with them. How did hard-pressed housewives feed their families on ever-tightened rations, and what were the rations and what were the alternatives, how was clothing rationed, how did you furnish, decorate, heat and even clean your house in the face of yet more rationing. How did people travel with the blackout, petrol rationing, road blocks and restrictions? 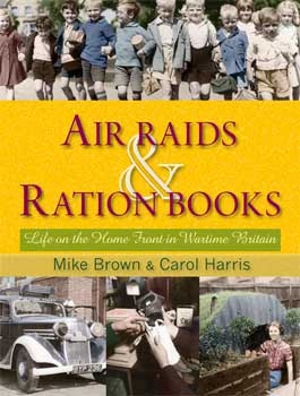 ‘Air Raids and Ration Books’ answers these and many other questions about everyday life on the home front. This lavishly illustrated book draws on contemporary sources including government advice, periodicals and books, and benefits from an entertaining narrative by authors Mike Brown and Carol Harris. Mike Brown is an authority on the Home Front during the Second World War and is author of several books, including The 1940s Look, The 1950s Look, and is co-author of Digging for Victory and The Ration Book Diet. Carol Harris is a journalist who specialises in the history of fashion in the 1930s and 1940s. She is the author of ‘Collecting Fashion’ and, ‘Women at War: The Home Front’, co-author of The Ration Book Diet, and has also contributed to exhibitions at the Imperial War Museum.